The job comes with long hours and late nights, said Reidar Larsen, a graduate student who started working at LASP as an undergraduate at CU Boulder. But it also gives students something they can’t get at any other university: hands-on experience with scientific instruments orbiting hundreds of miles from Earth. The students have a soundboard of audio alerts that would rival most morning radio shows. There’s a clip of Chewbacca roaring, R2D2 beeping and the one you don’t want to hear: “Red alert. Red alert. Houston, we have a problem.” Each one means something different for different spacecraft. “If something big happens, we have audible alarms that say ‘Hey, look at me. Something’s wrong,’” said Larsen. Learning the ropes, however, is a bit of a juggling act. 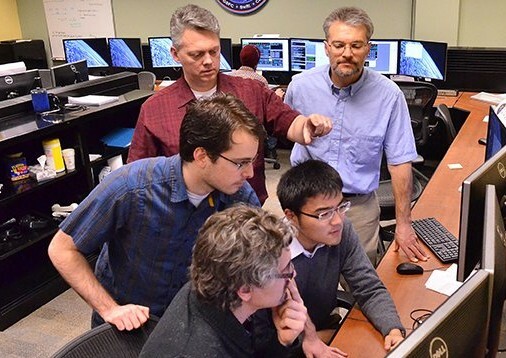 In addition to MMS, LASP oversees aspects of the operations for NASA’s Solar Radiation and Climate Experiment (SORCE) and Aeronomy of Ice in the Mesosphere (AIM) missions. The institute has also branched into operating toaster-sized satellites called CubeSats. On any given day, roughly one dozen student operators might send new instructions to one of those spacecraft, run diagnostics to make sure it’s working correctly or troubleshoot if something has gone wrong. That much responsibility takes a lot of commitment. To qualify as command controllers at LASP, students undergo an entire summer of training, amounting to 500 hours. And because spacecraft don’t stick to regular work hours, the students often pull shifts on weekends and nights after their peers have gone to sleep. Ginger Beerman, a senior studying aerospace engineering at CU Boulder, agrees. “We learn a lot of things that you wouldn’t learn in your classes,” she said. In the operations center, however, things don’t always go according to plan. Students and professionals alike at LASP worked around the clock until they could pull Kepler out of the emergency. That sort of problem solving is what Larsen loves most about being a command controller. Such an approach to fixing problems also explains why former LASP command controllers have gone on to work at hubs for the aerospace industry. That includes Lockheed Martin Space, Blue Origin and various NASA centers. Fellow junior Trevor Weschler added that his time at LASP has given him something even better than a resume boost: a personal connection to space. This story was written by Daniel Strain and originally appeared in CU Boulder Today.